La entrevista que otorga el empresario Rafael Cabañas a la revista especializada Talking Machine World no difiere mucho de lo que hoy expresan los representantes de las cúpulas empresariales. Sin ser un empresario totalmente imbuido en la industria cinematográfica, ser presidente de una compañía de fonógrafos le da certidumbre a lo que expresa en relacion a la industria a la que pertenece y es muy probable que los empresarios del cine no fueran muy ajenos sus ideas. Según Cabañas, el negocio ha crecido y la revolución se circunscribe a solo ciertas regiones; su percepción de la publicidad es muy moderna; termina por alabar a Huerta y justificar su gobierno. (Detesto que en inglés no exista la letra ñ; por fonética cambié todas las enes por eñes). Reviewed by Rafael Cabañas, President of the Mexican Phonograph Co., Which Handles the Columbia Line—Says Disturbances Are Confined to Few Districts and Have Been Greatly Magnified—Displays Faith In Future by Advertising “Talkers” Heavily. Rafael Cabañas, president and general manager of the Mexican Phonograph Co., Mexico City, Mex., was a visitor for several weeks recently at the headquarters of the Columbia Gramophone Co., Woolworth building, New York. 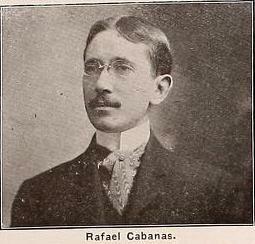 Mr. Cabañas enjoyed a ten days’ vacation at the summer home of Vice-President Burns, of the Columbia Co., at the Thousand Islands, and the rest of his time he spent in conference with the officials of the Columbia. Co. on plans and outlines for the ensuing year’s business. The Mexican Phonograph Co., which represents Columbia products exclusively, occupies an unique position in the talking machine realm by reason of the wonderful extent of its business. Some idea of its magnitude may be gleaned from the statement of Mr. Cabanas, that it does from 65 to 70 per cent, of the entire talking machine business closed in Mexico, and the Mexican public is recognized as one of the foremost exponent of the musical qualities of the talking machine. Rafael Cabañas has been connected with the talking machine industry for more than twelve years, and possesses a detailed knowledge of the business. His views on conditions in Mexico arc therefore interesting. “Our business this year has naturally suffered considerably from the ill effects of the Mexican revolutions.” stated Mr. Cabañas in a chat with The World. “At the same time, however, there is an exaggerated idea apparent in this country regarding the extent of the business losses sustained by the merchants of Mexico, and the actual loss is not nearly as great as the average American business man believes. “The one redeeming feature of the serious Mexican revolutions is the fact that the fighting and disturbances are confined to certain parts of the country districts, and arc not by any means universal. In the sections of Mexico where the disturbances have made their presence most strongly felt we naturally do not expect to close any business! which is, of course, at a standstill. The heavy losses in these districts arc more than offset, however, by the satisfactory status of business in the sections under Government control, and when our fiscal year closed the first of July we showed a gain over the business consummated the previous year. This gain was not, of course, what we expected, nor what it would have been with normal conditions, but it affords evidence that business is not at an absolute standstill throughout Mexico. “The revolutionary disturbances have, of course, retarded the expansion of our business, as the matter of credits must be carefully watched and considered during these periods of uncertainty. This is particularly true in the country districts where the troubles have been most pronounced, but we are all hoping that normal conditions will soon be enjoyed. “Our company showed its faith in the ultimate settlement of all disturbances by continuing to advertise throughout the entire period of revolution and trouble. We have always been liberal advertisers in the Mexican newspapers, and advertising is one of my hobbies. There are three or four leading newspapers in Mexico in which our advertising can be found year in and year out, and this advertising is producing gratifying results. We also advertise regularly in a few Mexican weeklies, and in addition utilize billboards and other means of publicity which we have found of considerable value in maintaining and increasing our prestige and business. One of these publicity “stunts’ is the installation of an immense sign advertising our products in the official bull fight arena, and I may add that this sign is one of our best advertising novelties. “From July 1 to date we have done about 60 per cent, of the business we closed during the similar period of 1912, and we have no cause to complain at this record, considering the severe handicaps to Mexican industry. Our branch offices throughout Mexico are inclined to be optimistic in their reports and the future is promising. 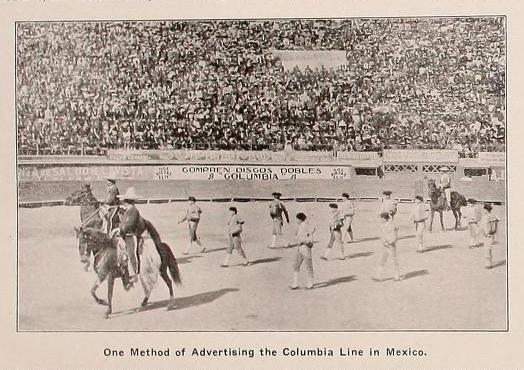 “The popularity of the Columbia products in Mexico is growing by leaps and bounds, and they have far out-distanced all competitors in point of sales. The Mexican records issued by the Columbia Co. have experienced a phenomenal sale, and as each new list is issued our clients’ enthusiasm regarding the prefect reproduction increases in proportion. The cheaper class of machines are at present at the height of their popularity in Mexico, but the more expensive types are gaming ground fast. “The subject of politics is, of course, the question of the day in Mexico just now, and there are many variances of opinion. Personally I believe that President Wilson of this country is making a serious mistake in failing to suitably recognize the Huerta administration. Those acquainted with the -true conditions in Mexico fully understand that the Huerta Government has the situation in hand as well as can be possibly done under the handicaps it is proceeding under. What the Huerta Government needs most is money, and this can only be secured when the Government is recognized by the foreign countries. Texto y fotos de Talking Machine World, Vol. IX, No. 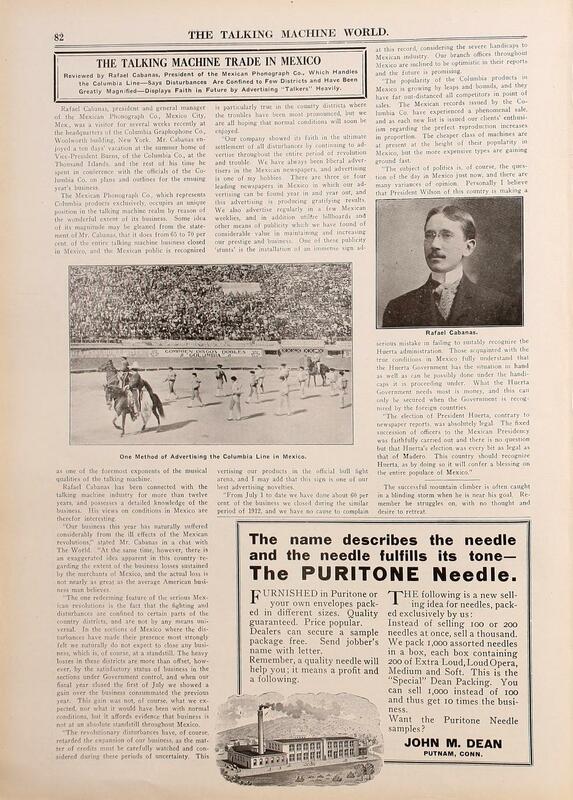 10, Oct. 15, 1913, p. 82.